One of the foods I've been missing is croutons. So when you can't find them, you just make them, right? They're much easier to make than you would think and don't take much time. These were made to go as an accompaniment to my pizza soup but they can be used on anything! My son was just snacking on them while I was preparing the rest of our dinner. 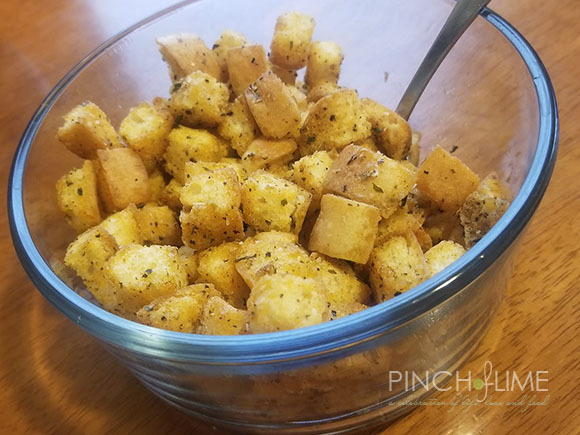 He even said they were the best croutons he's ever had. My non-gluten free guys really liked these so I'll probably be keeping these around for awhile. Cut baguette into 1/2" cubes. Place remaining ingredients, except butter, in zip top bag and mix together well. Add bread to bag and zip closed, leaving air in the bag. Shake the bag to coat all the cubes (the air in the bag helps make even coating). Line a baking sheet with foil and lightly coat with non-stick spray. Spread the cubes in a single layer and bake for 10 minutes. Melt butter in a small bowl. Remove baking sheet from oven and drizzle bread cubes with butter. Toss well to coat. Place back in oven and cook for another 5 minutes or until crispy and golden brown. *The spices/herbs can easily be replaced if you don't like some or want to try different kinds. Just make sure all of them are gluten free!